1. Sign-up bonus is limited to new players who have registered a real account and deposited the qualifying amount. 2. The wagering requirements are 15 times the combined value of the purchase and bonus. 3. Please note that any bets placed on Blackjack, Video Poker or Multi Hand Video Poker will contribute one quater of their original value towards wagering requirements (meaning that the sum of bets placed on these games is divided by four when calculating wagering). The play bonus wagered in Baccarat, Roulette, Craps, Sic Bo is void. 1. This Bonus is only valid for deposits made using the following methods: Credit / Gift Card, eWalletXpress, UseMywallet and Click2Pay. 2. This noncasable Bonus has a wagering requirement of 50 times the combined total of the bonus plus deposit before any withdrawal. 3. Each coupon can only be redeemed by the player one time. You can play only blackjack, roulette, craps, baccarat and paigow poker. 1. This offer is valid for first time depositors at the casino. 2. This bonus is only valid for deposits made using the following methods: Credit / Gift Card, eWalletXpress, UseMywallet and Click2Pay. 3. 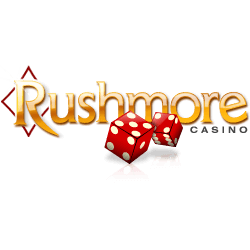 This offer may not be combined with any other bonuses offered by Rushmore Casino. 4. This noncasable Bonus has a wagering requirement of 20 times the combined total of the bonus plus deposit before any withdrawal. Only bets placed on slots, keno and scratch cards can be played. 50% match to play Slots, BlackJack, Video Slots, Keno, Scratch Cards and Video Poker. 1. 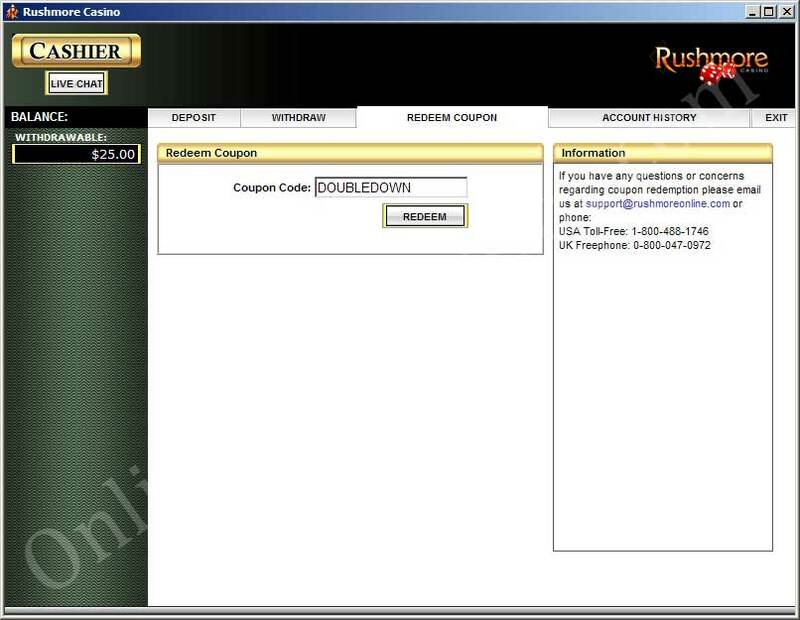 Unless otherwise stated, this offer may not be combined with any other bonuses offered by Rushmore Casino. 2. Deposits of a minimum $25 and maximum $1000 qualify for this bonus. 3. This noncasable Bonus has a wagering requirement of 20 times the combined total of the bonus plus deposit before any withdrawal. Only bets placed on slots, keno and scratch cards will count towards the wagering requirements. If you withdraw before having reached the minimum wagering requirements, your bonus and winnings will be void. NB! Any bets placed on Blackjack, Video Poker, or Multi Hand Video Poker will contribute one third of their original value towards wagering requirements (meaning that the sum of bets placed on these games is divided by three when calculating wagering). 1. This Bonus is ONLY valid for deposits made using Credit / Gift Card, eWalletXpress, UseMywallet and Click2Pay. 2. Unless otherwise stated, this offer may not be combined with any other bonuses. 3. This is a noncasable Bonus with a minimum deposit of $25 and wagering requirement of 20 times bonus and deposit amount for Slots, Scratch Cards and Keno. 4. Any bets placed on Blackjack, Video Poker, or Multi Hand Video Poker will contribute one third of their original value towards wagering requirements (meaning that the sum of bets placed on these games is divided by three when calculating wagering). Only the following games will count towards the bonus: Slots, Real Video Slots, Keno, Scratch Cards and Blackjack. 1. This is a PLAY Bonus ONLY valid for deposits made using the following methods: Credit / Gift Card, eWalletXpress, UseMywallet and Click2Pay. 2. This Bonus has a wagering requirement of 20 times the combined total of the Bonus plus Deposit before any withdrawal (including the deposit itself) can be made. 3. Any bets placed on Blackjack, Video Poker or Multi Hand Video Poker will contribute one third of their original value towards wagering requirements (meaning that the sum of bets placed on these games is divided by three when calculating wagering). Only the following games will count towards the bonus: Slots, Real Video Slots, Video Poker, Keno, Scratch Cards and Blackjack. Non-deposit bonus that gives out 40% of your winnings back if you currently have pending withdrawal. Make five deposits in Slots Oasis Casino and submit your Authorization Form within a month of your first deposit. Once it's approved, you will be entitled to 10% of your last five deposits in CASH. Joining Rushmore VIP's gives you a number of prerogatives like the one where VIP members get bonuses that will triple their balance, on their first five deposits of the weekend, for a total of $5,000! 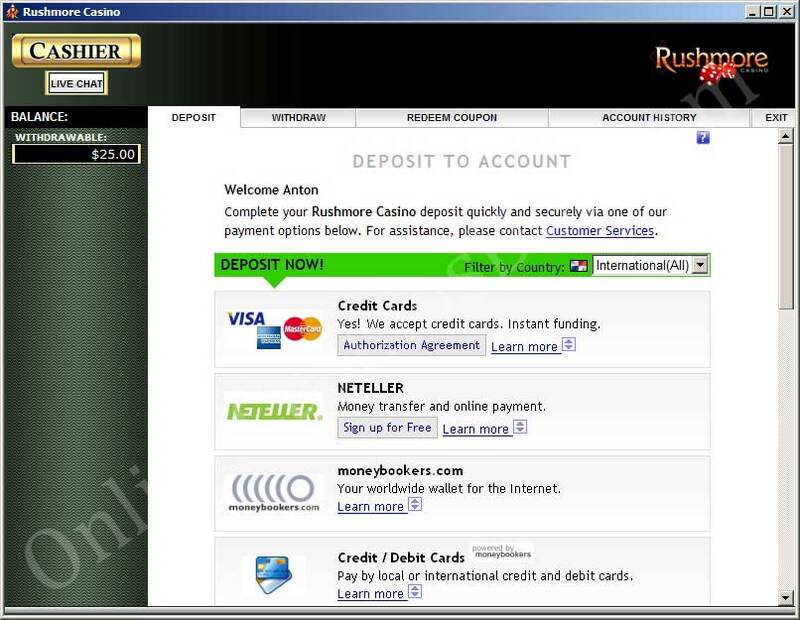 The subsequent five weekend deposits trigger match bonuses of up to $3,750. That makes a total of $8,750 in available bonuses from Friday noon until the end of Sunday! Besides Rushmore VIP members enjoy substantially higher table limits, which makes for more fun, more excitement, and more payouts. 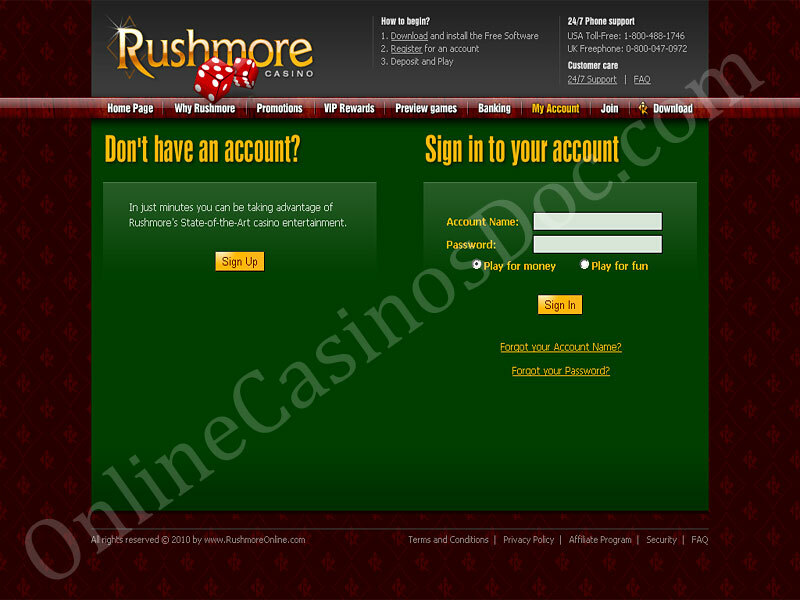 If you want to claim any of the bonuses offered above, you need to register a personal account at Rushmore Casino. You can do this either directly from the site or through downloaded version of the casino. Note that you have to choose to play for Real Money but if you have a Fun account, it'll work but you will have to go through Customer Registration for the Cashier. 4. In the right bottom corner of the Casino Lobby you can see your balance (in fact the sum shown in is a sum of your deposit plus bonus). 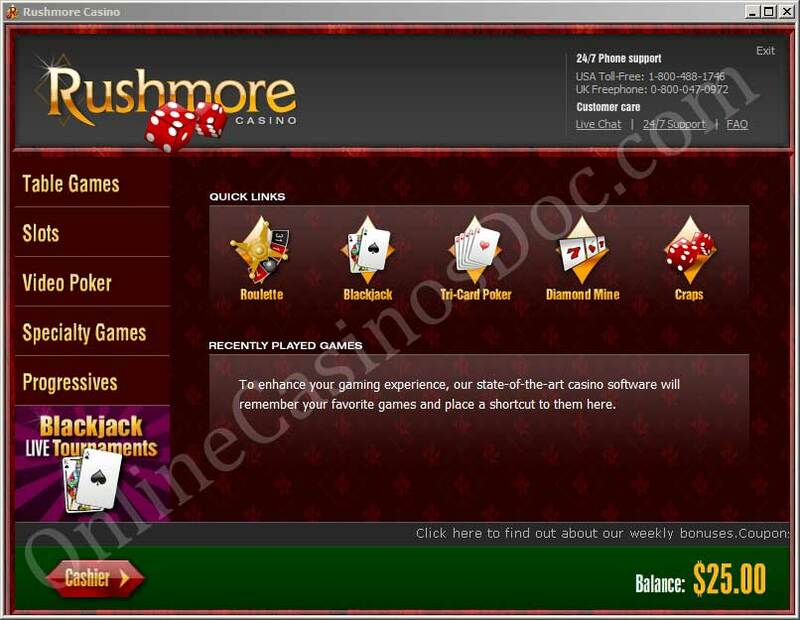 Rushmore Casino doesn't have a separate Bonus Account like some other casinos and the bonus money is credited to your general account.